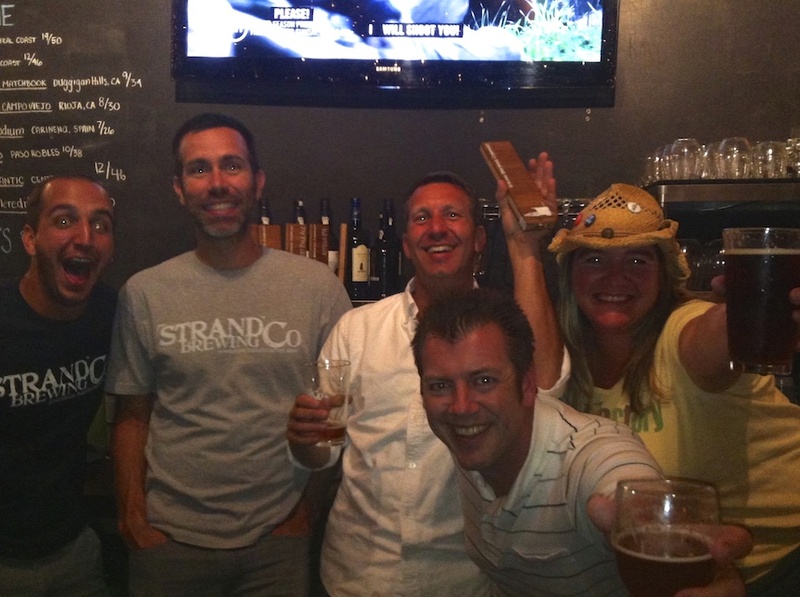 Natalie Gutenkauf and husband Eric Gutenkauf (right) with Rich Marcello (center) at a May 2014 Meet the Brewer event at The Factory. Natalie Gutenkauf and Rich Marcello met nearly five years ago to the day. Marcello, the co-owner of Strand Brewing Co. in Torrance was delivering the first shipment of beer to Gutenkauf’s new gastropub The Factory. The two new businesses got off to a slightly bumpy start as Marcello forgot to bring the tap handles and had to retrace his wet and rainy route back to the South Bay. 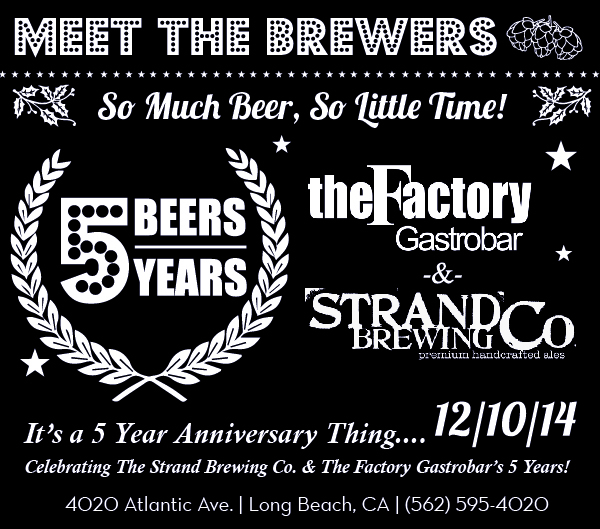 But five years have passed, and tonight, The Factory and Strand celebrate a joint anniversary, offering up five beers for five years with each beer representing a year of friendship. Marcello said he starts off most speaking engagements by acknowledging that his business “should have failed.” Citing a lack of funding and business experience, he said most start-up businesses don’t make it past the first year. But the fit was perfect between Strand and The Factory. He had the product, and Gutenkauf had the thirsty customers. Gutenkauf echoed that sentiment, stating that through the years she’s used Marcello’s company as a sort of a measuring stick and Marcello himself as a sounding board as the two small businesses established themselves and started to grow. Despite not experiencing the type momentum that the craft beer industry as a whole has seen, she said she’s grateful to have established a relationship with a company like Strand. That’s why Gutenkauf said the anniversary is less a celebration of the businesses and more of the good people running them. The idea to celebrate jointly was first proposed to Gutenkauf at a wine and beer festival this summer when Marcello brought up the idea of commemorating their friendship with a co-anniversary celebration. 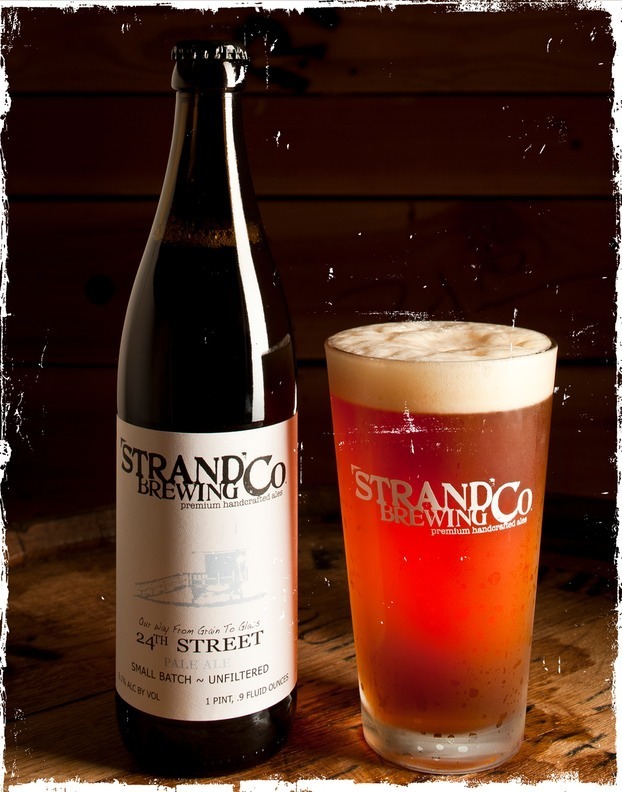 He’d supply some rare beers, but also a classic—the very first beer Strand brewed, and the first it delivered to The Factory; 24th Street Pale Ale. In addition to the pale ale, Strand will be tapping a few more exotic brews that rarely make it into kegs, and if they are on draught, are usually confined to the brewery’s tasting room in Torrance. According to Marcello, attendees of tonight’s celebration will be able to choose from their Expression Session IPA, Batch 100 Stout and a cask version of Strand’s Black Sand IPA which has been infused with ginger and lime peel. The Factory has been saving kegs for the occasion and plans to have the original eight beers they opened the restaurant with in addition to past favorites at the January event. Gutenkauf said that the focus will be on the beer tonight, so patrons can expect a normal menu for tonight. Although The Factory’s anniversary is in December, the restaurant has planned a much larger celebration in January that will include live music, a throwback menu and an estimated 20 craft beers. The decision was made to host the larger party after the holidays to allow everything to be enjoyed separately. Since The Factory opened, both the restaurant and Gutenkauf have been honored in various ways ranging from being featured on Food Network’s Diners, Drive-ins and Dives this year, serving as a celebrity judge on Bravo’s Top Chef, being named as one of the top 5 female chefs in Long Beach and being honored by Senator Ricardo Lara as a Woman of Distinction. But out of all the accolades, a moment in her personal life is the one that stands out the most since she opened The Factory five years ago. “My favorite moment has to be two weeks ago when I found out my daughter has a clean bill of health after living with a brain tumor,” Gutenkauf said. Her daughter was diagnosed with a brain tumor when she was five years old and underwent her first brain surgery the day before her sixth birthday. After years of uncertainty, having her 8-year-old daughter healthy is something that Gutenkauf said will allow her to rededicate herself to her craft. There were moments when she doubted her ability to keep her business afloat while tending to her daughter and raising a family, but with the positive news Gutenkauf said she expects The Factory to soar now that she’s back, emotionally. The Factory Gastropub is located at 4020 Atlantic Avenue.